popular US restaurant chain one afternoon to grab a quick bite. I collected my order and sat down, and promptly forgot all about my food­. There, at the next table, was the epitome of American motherhood. Mother bear was devouring a bonding meal with her sweet tweener-a thin, petite girl, who didn't look anything like her. Truth be told, it was more like looking at a whale and a sardine. Anyway, the reason I forgot about my food was not so much Mama's size as much as the way she was striving hard to supersize her pretty, slim daughter. She'd ordered a family-sized pizza for the little girl, to be washed down with a jar of coke. A few years of this, and mother and child would, no doubt, be the personification of similitude-size-wise, at least. To be fair, it has to be said that most portions served in the US are large. I looked down in dismay at my salad, which could feed an entire neighborhood in India. It was another reminder of all the hard work American mothers are putting in to help the US economy. The little girl at the next table didn't understand this, and didn't finish the pizza. But, sadly for her, it wasn't left behind, and was instead packed and taken home to be force-fed to her later. Apart from someday matching her mother's size, she will be stricken with similar health problems, and end up doing her best to support America's healthcare and beauty industries. When you think about it, our mothers must have been nuts to make us finish our greens. And we are nuts to do the same to our children. My daughter needs to eat her vegetables every day, and if she misses, she needs to double the quantity in the next meal and skip the roti/rice. Junk food is for a day on the weekend. I thought I was helping her with this regimen. But the American mother put me to shame. There is really no business case in consuming veggies. Imagine everyone eating their greens, and the investment in vegetables and farming go up. Imagine it being an enormously profitable business (it still is, but the volumes in mass segments across the developed world are decreasing). Wouldn't it put pressure on entrepreneurs to start farms? Wouldn't that mean more greenery? Wouldn't that mean fresh air? Wouldn't that mean a drastic drop in lifestyle diseases and lower medical costs? Wouldn't that mean clear skins, clean stomachs, shiny hair? Ah, but then what would become of the pharmaceutical, medicare and cosmetic industries? Kaput! No other nation understands this better than Estados Unidos de America, the US of A. 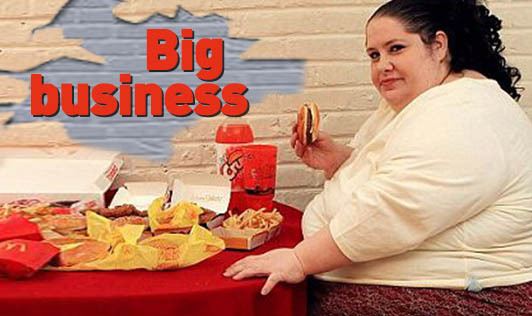 Over 60% of America is fat. And while Americans spent about $6 billion on fast food in 1970, they spent more than $110 billion in 2001. Studies show that they are now spending more on fast food than on new cars, computers, computer software or even higher education. Fast food sales are higher than videos, books, movies, magazines and recorded music sales combined. An average American consumes 3,747 kilocalories, whereas the recommended allowance is 2,000-2,500 for sedentary- to moderate-activity people. A third of the calorie intake is from junk food. And that's not all; the serving sizes have gone up too. A typical hamburger in 1957 weighed 1 ounce (28 grams) and contained 210 calories. A typical hamburger today weighs 6 ounces (170 grams) and contains 618 calories. There are even steakhouse restaurants that offer a free meal if you can eat their 96 ounce (2.7 kg) steak in a certain amount of time. Want to try it? Make sure you have an ambulance on stand-by before you begin gorging. For the life of me, I cannot understand how a country that has progressed so much, so fast cannot see the health bomb it's sitting on. My salad-eating, fruit-munching, fish-and-nuts focused mind simply cannot fathom how Americans consume as much as they do. It brings to mind something from Chetan Bhagat's book, One Night @ The Call Center: apparently, call-centre trainees are taught that the brain and IQ of an average 35-year-old American equals that of a 10-year-old Indian kid. Read the book if you don't believe me. Was Bhagat struck by sudden enlightenment in a flash? Didn't anyone know that before? Well, if you have any doubts, look at who the country chose as its 43rd President (hanging chads notwithstanding). And, if you still have doubts, remember that the same man was re-elected for a second term. So, despite food prices rising 4.8% in 2007, the average American family of four still spent about 13% of its disposable income on it. A 2003 study conducted by the University of Tennessee showed that a child's eating habits are strongly influenced by the mother. Another survey found that of the top 24 disliked foods, 17 were vegetables. So, today, at long last, American mothers are being exhorted to work harder at adding more fruits and vegetables into the family diet, while (surprise, surprise) cutting down on the sodas. Duh! A simpler solution would be to send a bunch of Indian housewives across the Atlantic to slap some motherhood into their counterparts. While the world wakes up to the goodness of vegetables, and benefits of Thai and Chinese cuisines (not Punjabi Chinese, as made in India), affluent Americans have begun to realise this too. As an American colleague of mine in our San Francisco office said: "It's easier to be healthy in India with the large buffet (read hotels) options of vegetables. In America, you need to be rich to have that choice." He pretty much went from an all meat-and-potatoes-and-bread diet to a pure vegetarian one, but only after most of the damage had been done to his arteries. Well, at least he's trying. The average American, like his or her serving size, is expanding. And, over the years, the stores have begun keeping up by making their XS & S sizes larger. In some ironic way, perhaps, all this may end the teasing that fat kids have to endure in school and the psychological problems that accompany such mockery. With all of them pretty much the same size now, who will cast the first stone?